Small sized snacks or appetisers can be tricky if you are minding your calories or your overall nutrients. Fried or even baked appetisers come loaded with refined flour and butter mostly, so decadent that you never stop at one. Imagine conserving that decadence in such recipes even when using healthy alternatives and making the appetisers worth each calorie they have. 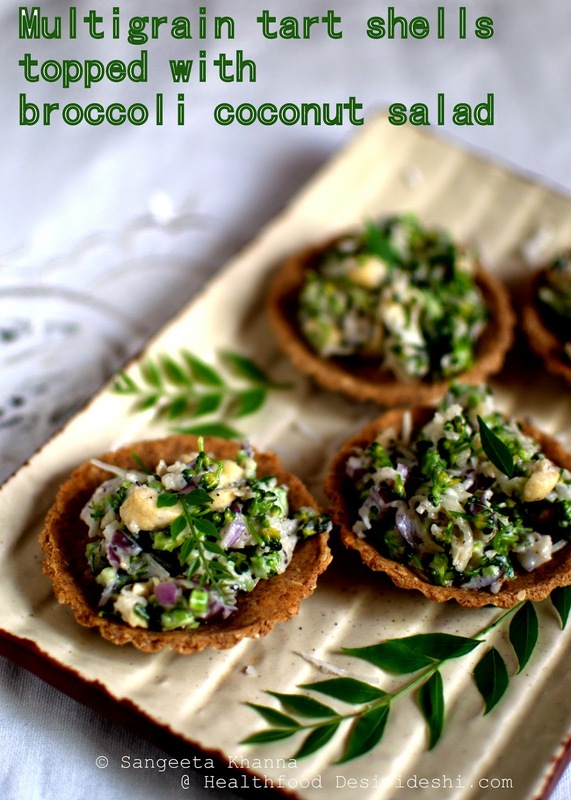 These multigrain tart shells filled with a broccoli and coconut raw salad are one such example of great looking tasty food that doesn't pinch on your calorie wallet. 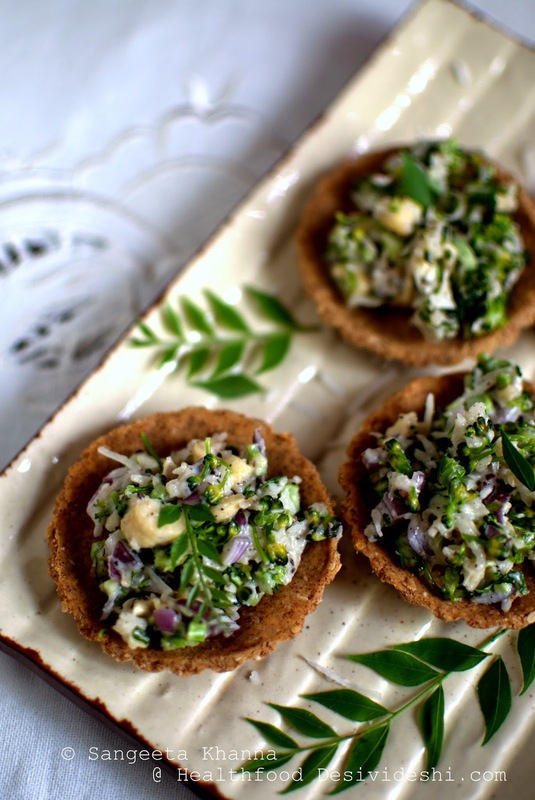 These gluten free multigrain tart shells filled with broccoli coconut salad with bits of cashew nuts is one such decadence I am talking about. Read on where I got the idea. 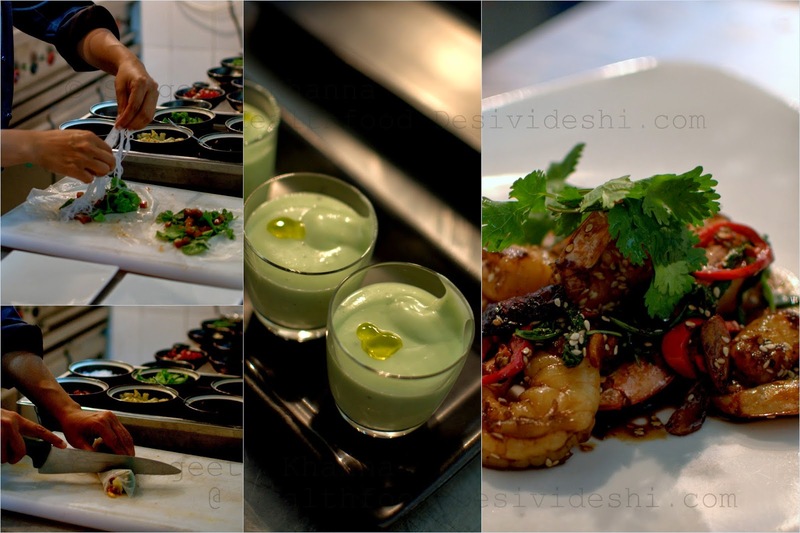 Ritu Dalmia recently held a masterclass at her swanky restaurant Diva Kitsch and shared some of her signature recipes from the restaurant menu. These sesame crusted tart shells were easy breezy small bites that she shared with us. 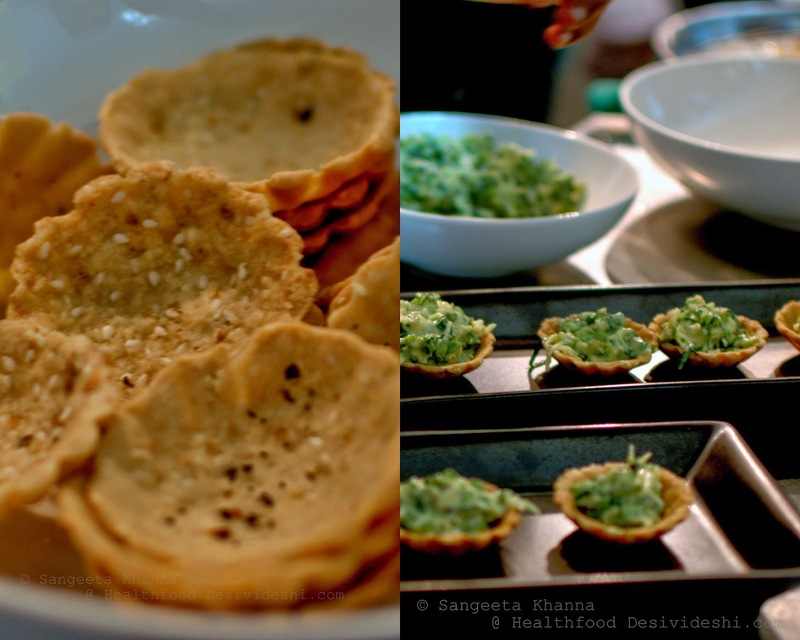 I loved the idea of a south Indian poriyal style salad filling for the tart shells. She had used zucchini and coconut milk among other things for the salad. I was invited to her first masterclass of Italian Khana and had cooked her pumpkin pancakes at home. Her recipes include a lot of seasonal vegetables without much processing and I love this fact. This time the focus was on Asian recipes and I loved each one of them. This coconut based salad was a natural choice for me being the coconut lover that I am. I keep baking crackers using alternative gluten free flours and decided to bake some tart shells this time. The salad was made using broccoli and some broken cashew nuts and this salad made us crave for more. I made it again and used as a ragi dosa filling within a week and now I know this salad would be a regular at our place. Easy raw salad recipes that keep well in the fridge are my best friends. I will also be making the avocado soup with hints of wasabi that Ritu demonstrated. Here she is adding fresh avocado to the blender along with a wasabi mayonnaise (vegetarian). This soup is one of the bestsellers at the restaurant. The Vietnamese rice paper rolls with assorted vegetables has always been a favourite, I loved Ritu's twist on it. 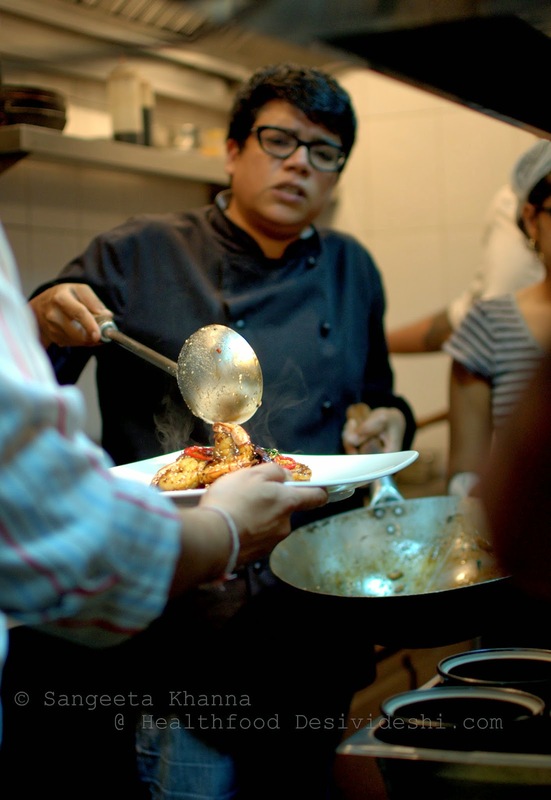 She made us participate in her own kitchen and someone made a burnt garlic soya prawns with a generous sprinkling of sesame. Lovely flavours were created within about half an hours time and Ritu Dalmia kept everyone superbly entertained by her spontaneous humour. Later a few cocktails were mixed at the cheery bar at Diva Kitsch that overlooks the bustling market below in the upmarket Defense Colony. 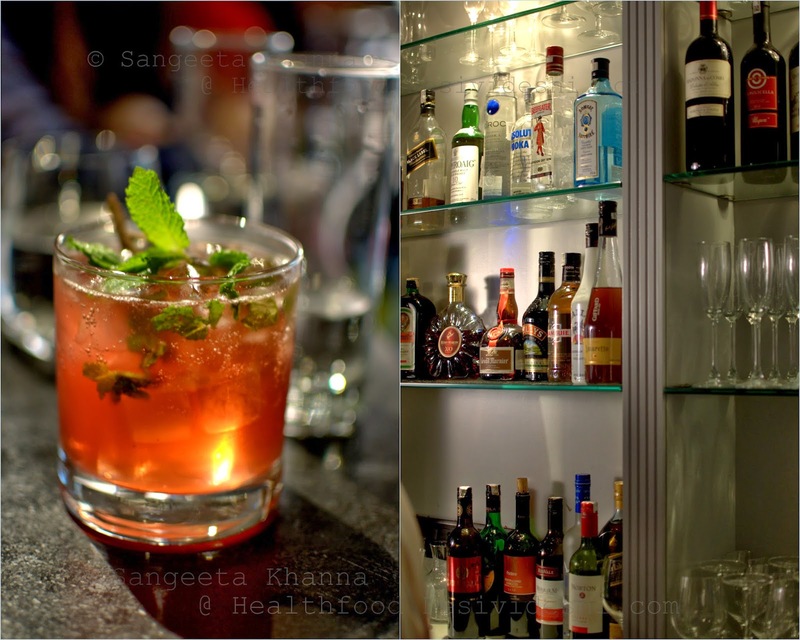 Modern Asian cuisine is the forte of Diva Kitsch and the cocktails reflect a few innovative Asian flavours as well. 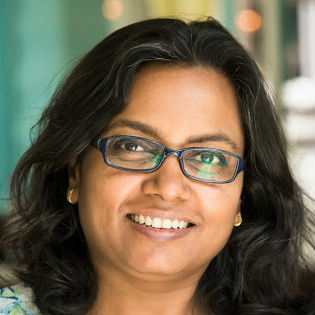 Ritu Dalmia says that the menu at Diva Kitsch is inspired by all her travels across Asia. From the streets of Vietnam to Burma, food markets of Thailand and many more such experiences. 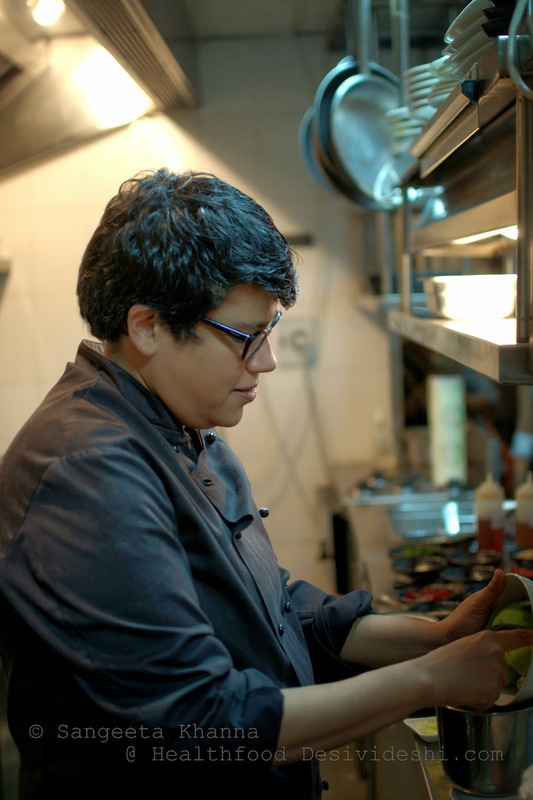 Her work is inspiring for me as I love the way she plays with fresh ingredients and flavours with so much ease. 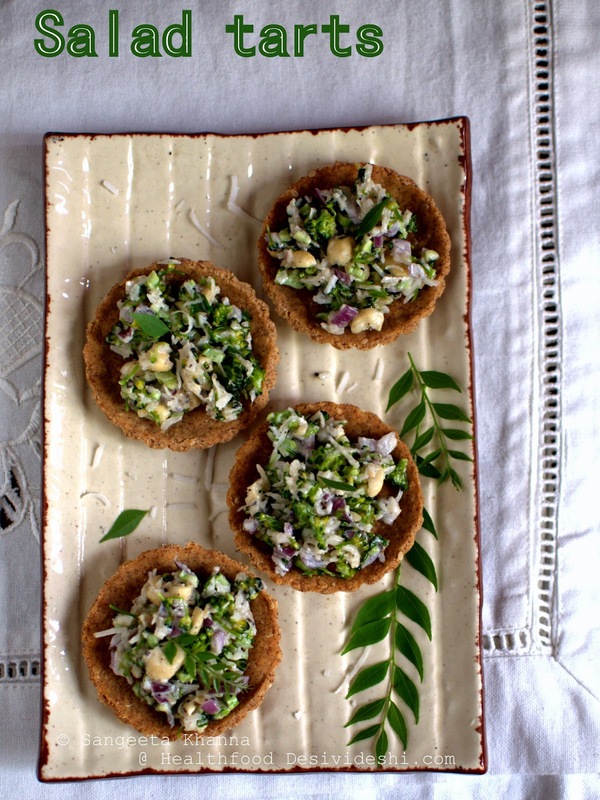 She actually made it easy for me to create this raw broccoli salad with coconut. Quick to make, versatile and oh so yummy. I used shredded dehydrated coconut and coconut milk powder in this recipe for my own convenience, and for enhanced flavours too. You can always use fresh grated coconut instead of these two. Cut cold butter in small cubes and mix well with everything else apart from yogurt and mix well. I did this step in the food processor. Add yogurt in the last to knead a stiff dough. Roll out the dough into a thin sheet and cut out using tart shell moulds, press each individual tart shell into the mould well and arrange them all on a baking tray. Bake at 170 C for 25-30 minutes in a preheated oven. The time will depend on how thin you have rolled the dough. This dough will be a bit tricky but not difficult if you use a sharp knife to lift the cut outs. Don't worry if it breaks, it can be pressed down in each tart case. I made some crackers with half the dough. You can also try that. Mix everything together and let it rest for half an hour before serving. The salad keeps well in the fridge for a day. You would like to use it for many other things for breakfast, snacks or meals. Add some grated cucumber or zucchini, may be some toasted sesame if you like, or keep it simple like this. Have it filled in tart shells or topped on crackers. I know this will be a favourite salad for you if you love coconut. Flavours of broccoli are not much prominent in this salad but it gives it a nice body and texture. These look so good, I love Ritu’s recipes and have tried a few…maybe should look for more.